There’s nothing worse than being replaced, which means it’s probably been a hard few months for R2-D2 ever since BB-8 stole the internet’s collective heart during Star Wars Celebration. “Remember when I was the droid you weren’t looking for!” R2 cries out in beeps and boops as he sobs himself to sleep. Now the feisty astromech droid is trying to stay relevant by downsizing into a tiny remote controlled toy. Created by Japanese toy company Takara Tomy, this little R2 stands just over an inch tall. He’s fully motorized so he can be steered around a flat surface while his dome swivels. He also beeps and boops and even has little lights. The toy is controlled by a regular-sized lightsaber handle that also serves as its charging station. Ten seconds of recharging produces 40 seconds of exploration time. The toys do look awfully cute while roaming around, as seen in the video below, but whether or not that will be enough to halt the juggernaut that is BB-8 remains to be seen. 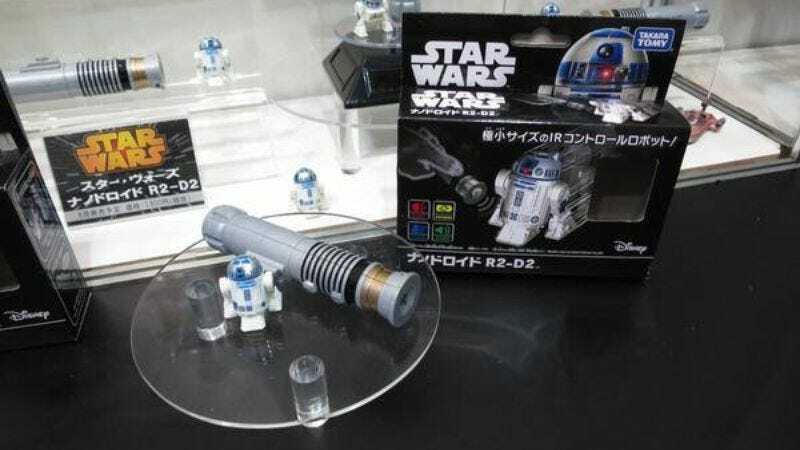 The little R2-D2 will be available for $30 starting in August.